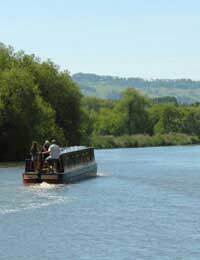 The inland waterways of the UK are a very popular holiday destination for those who want an exciting new way to experience the wonders of this green and pleasant land. A 2000 mile network of canals and rivers through some of Britain’s most fascinating historical cities and most beautiful rolling countryside await the intrepid adventurer at the controls of a narrowboat or motor cruiser. A typical inland waterways holiday is a week long leisurely cruise down a river or canal at the helm of a narrowboat or a motor cruiser with family, friends or just alone with a partner. It is up to the passengers whether they want to stay on board all day and watch the world move slowly by or make regular stops to explore the many tourist attractions en route. When the day is done the boats provide comfortable accommodation for the nights moored up, including fitted kitchens, double beds and electricity. River Cruising or Canal Barging? It is worth considering the effort involved in working locks along the journey. Some boaters find the frequent activity of working locks on a canal passage fun, especially as part of a group, but those looking for a more relaxed voyage might prefer the less frequent interruptions of a river cruise, where the few locks are operated by lock keepers. Narrowboats and motor cruisers can each accommodate between two and twelve passengers. Narrowboats are available in sizes up to 70ft in length, whilst similarly berthed river cruisers are shorter but wider. Most narrowboats and cruisers are self-drive and hire companies do not expect any previous boating experience or qualifications before letting out their crafts. It is relatively simple to master the controls and the hire fleet operators will give a short tutorial before the voyage begins. Nevertheless the Royal Yachting Association (RYA) offer an Inland Waterways Helmsman’s Course for those serious about their role as cruising skipper. The courses teach students about boat and personal safety, helmsmanship, basic engine checks, negotiating locks, bridges, tunnels and other vessels and care of the environment. Self-drive also means that they are self-catering so consideration will have to be made for food and drink provisions both before the trip begins and en route as the boats cruise past local shops and pubs. The boat kitchen will likely include hobs, a grill, fridge and possibly even an oven and a microwave. Most boats will be star rated like a hotel or guesthouse to give an indication of the quality of accommodation and the extent of the facilities on board. Time and speed restrictions - 4 mph on canals whilst some rivers have a 5 mph limit - mean that unfortunately it is impossible to cover all of the UK’s waterways in one single holiday! On average most people manage around four to five hours of cruising time a day, which means around 100 to 120 miles in a week. It is sensible therefore to settle on one particular area of waterways. For example a trip along the Forth & Clyde and Union canals would take in the stunning scenery of the Scottish Lowlands as well as the cultural and historical treasures of Glasgow and Edinburgh. The River Thames and Oxford and Grand Union canals lead cruisers through the scenic thrills of the Chiltern Hills and the Thames Valley before entering London’s fascinating city sprawl and arriving at the urban oasis of Little Venice. When Britain’s waterways have been exhausted there are limitless opportunities for exploration down the canals and rivers of mainland Europe. Motoring down inland waterways is a great relaxing way to spend a holiday and those reluctant to return to dry land at the end of it can always buy a house boat and extend their holiday to a lifetime.